coriandro, O Cast. culantro, OCat saliandre, celiandre, Gr koriannon (fr koris, bedbug) L. Coriandrum sativum, ME coliaundir, colyandre (the seed), Eng. 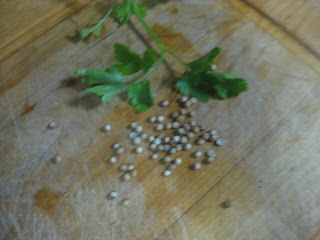 cilantro (the entire plant), coriander (the edible seeds). It has become symbolic of healing, health and love. The plant has been confused with parsley for the likeness of the leaves. Cilantro is thought to be a native of the Mediterranean. According to Sanskrit records, it has been known for 7,000 years. It is believed to have been part of the Hanging Gardens of Babylon. Jews ate it during Passover. In the Bible, Exodus 16:31and Numbers 11:9 coriander is likened to manna. Romans introduced it to Spain but it was forgotten with time. The Moors reintroduced it to Spain by 822 for Ziryab is reported to have drunk a cilantro beverage that was popular in court and among the harem of the emirate. For Hispano Muslims, it became an essential flavoring and coloring. It is thought that it was grown in the royal gardens of Seville during the 11th and 12th C. The fresh leaves and the seeds were eaten. Although it continued to be used in Spanish cuisine, it fell into disuse in England when new, more exotic spices came on the market during the Renaissance. Pliny claimed that the leaves have a strong odor like crushed bedbugs. The seeds can be kept for long periods. They should not be ground until ready for use to prevent the loose of flavor, which is sweet, warm and mild, somewhat like orange peel. They contain 20% sugar, oil and vitamin C. It is the only herb considered to have a cooling effect. Perhaps that is why it has appeared as an ingredient in nearly all meat dishes, soups, comfits and baked goods. Mixed with vinegar they prevented future breakdown of meat fibers. When Muslim recipes call for “dried” cilantro they actually mean coriander seeds. Care should be taken not to consume too many seeds as they can act as a narcotic, producing a type of inebriation that can last all day it. It was thought to be an aphrodisiac in the Middle Ages as noted in Knights. It was consumed after meals to help the digestion and dissipate gases. The seed has been used to mask bad tasting medicines like purgatives. It is a carminative (used for flatulence), a digestive (used to stimulate the intestines and stomach and to bring on menstruation) and an aromatic stimulate. Grind the meat. Dice the cheese. Take care that it is not too soft or it will fall apart. Add it to the meat. Beat an egg and mix it with the meat and cheese. Season it with pepper, cloves, and dry coriander. Put mint in a food processer with 1 cup water and grind it to make a juice. Do the same with cilantro. Stain the juices through a sieve and add 1/8 c of each juice to the meat and cheese mixture. 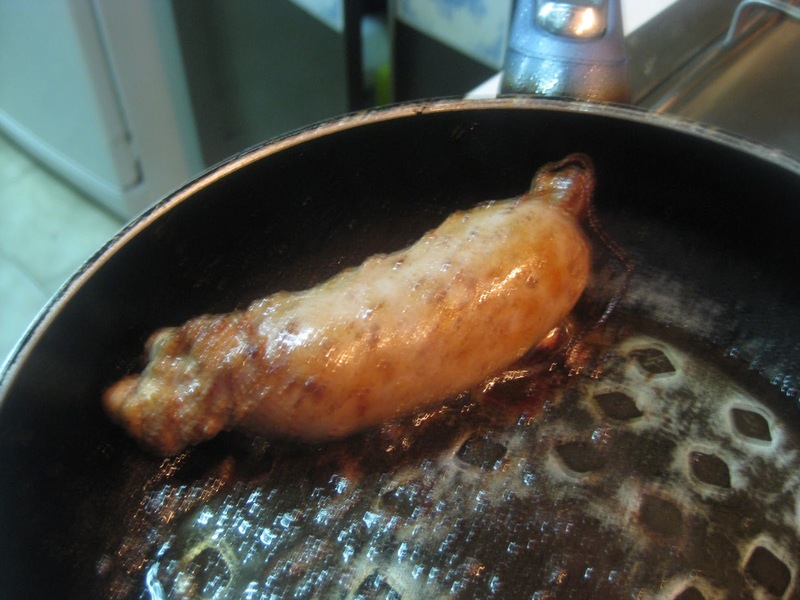 As this is an Hispano-Arab recipe pork is not used but is an alternative for Christians. 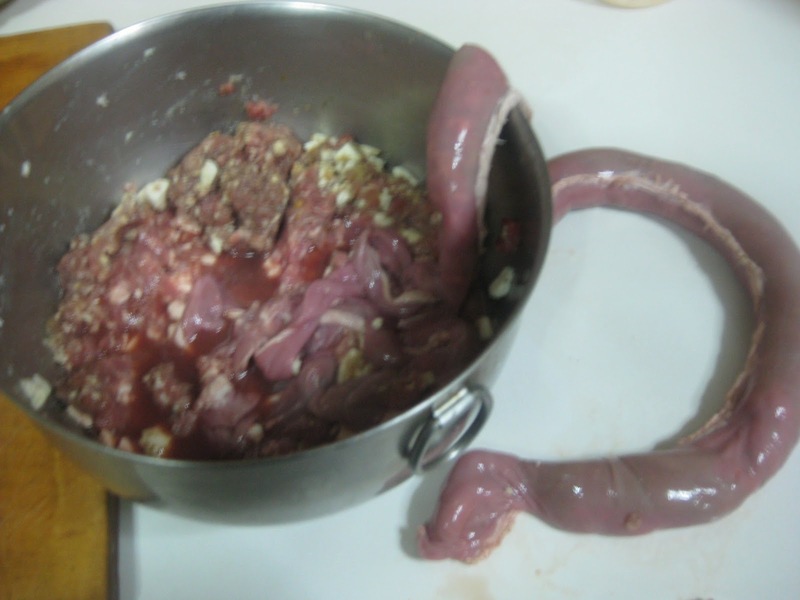 A pig’s intestine is about 70” long, while this mixture only occupies about 50” of intestine when stuffed. Cut off the empty intestine and save for another inspiration. Although it would be unusual to use deer as meat for the sausage, the sauce suggested to be used with deer could be used here. See the blog titled ciervo, published on January 25, 2013.